Dr. Walter McDonald became almost a legendary figure at St. Patrick's College, Maynooth, where he was a professor for almost forty years, until his death in 1920. He had been since 1888 prefect of the Dunboyne Establishment for post- graduate students. Many of the .Irish bishops and leading prelates in Britain, America and Australia had studied under him. A brilliant and exciting teacher he was determined to raise the standards of education in Maynooth. Holding that every professor should be required to publish original work, he chose a highly controversial subject himself. His book on Motion was referred to Rome and there condemned, without any opportunity for discussion. This, the first of his many controversies, made rum suspect as a fomenter of trouble, but he continued his active work as senior professor of theology until his death. 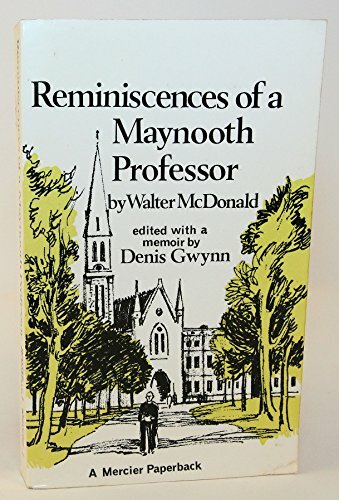 His reminiscences, which are here presented in an abridged form give a clear picture of the steady development of Maynooth in his time. Always independent and outspoken, he was greatly loved by Iris students. His book records his part in many controversies both in and outside Maynooth. He deplored the obligation to teach through Latin and he demanded free and open competition in all appointments to the staff. He urged that the laity should have much more influence in the management of schools and in all parochial matters. He strongly advocated the entry of Catholic students, in large numbers, into Trinity College, Dublin. When the Irish bishops expressed their united disapproval of Irish being made a com- pulsory subject in the new National University, McDonald championed Maynooth's ardent professor of Irish, Dr. C Hickey, who had been dismissed and then appealed to Rome.